ISLAMABAD: Turkish has assured Pakistan of its full support to find a peaceful solution to the Kashmir issue and said it would support Pakistan’s stance at every global forum. Turkish foreign Minister Mevlut Cavusoglu said that it’s Turkey’s wish that the Kashmir issue involving India and Pakistan gets resolved in a peaceful manner. “In the group that has been formed on Kashmir in the UN, we will stand with Pakistan and try to make its endeavors successful.”, he said while addressing a joint press conference after formal talks with his counterpart Shah Mehmood Qureshi at the Foreign Ministry on Friday. During the talks which lasted for two hours Pakistan and Turkey expressed strong determination to make collective efforts in confronting Islamophobia and other attempts to malign or distort the great message of peace and respect for humanity imbibed in the Holy Quran and repeatedly demonstrated in the life of our Holy Prophet (PBUH). “There is a propaganda against Islam in Europe. We ran effective campaign against the Netherlands caricatures contest, and thank God they shut it down,” Mevlut Cavusoglu said. Pakistan’s membership for NSG also came under discussion during the talks, and Turkish Foreign Minister assured Pakistan’s bid for the membership would be fully supported. Current situation of the Muslim world in the context of Afghanistan, Iran and Kashmir were also discussed during the talks. Turkish Foreign Minister said trade and commercial cooperation between two countries have further strengthened and assured that Turkish companies would bring investment in Pakistan. “The security issue for both the countries is important and so is the economic and military cooperation”, Mevlut Cavusoglu remarked. The Turkish minister said that Pakistan and Turkey have suffered the most hardships in the war against terrorism and both countries would continue to cooperate with each other in fighting this menace jointly. Recalling failed military coup in 2016, Turkish foreign minister said Turkey will never forget Pakistan and its people’s help which would be ever remembered. “The Gulen movement has not only damaged Turkey but it caused destruction wherever it went, Pakistan helped us in that breaking the Gulen movement,” he recalled. While reiterating the “heart to heart” and “Two Countries, One Nation” relations between the two countries, Turkish foreign minister underlined that Pakistan will always have a special significance in Turkish Foreign Policy. He lauded Pakistan’s successful and strong action to subdue and defeat the menace of extremism and terrorism. 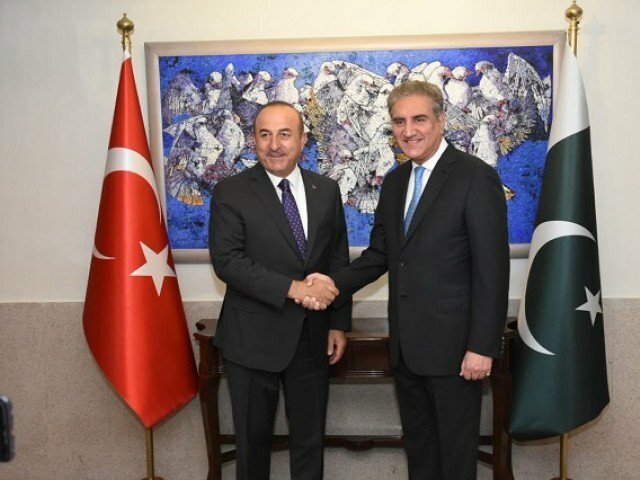 Pakistan’s Foreign Minister Qureshi stated that Pakistan and Turkey have been brothers, friends and partners. The inseparable bonds of common faith, history, and culture have been reinforced by mutual trust and a sense of inter-dependence on critical issues. “The strength of Pakistan-Turkey relationship is not relative to time, situations or individual choices. It is a relationship anchored in affection and solidarity among the people of the two nations,” Qureshi said. Cavusoglu in on two-day official visit to Pakistan. It is his fifth visit to Islamabad. Both Foreign Ministers held a one-on-one meeting followed by delegation level talks in which senior officials from both sides were present. Qureshi noted that regular exchange of high-level visits, and presence of a number of institutional frameworks under the High-Level Strategic Cooperation Council (HLSCC), was indicative of the close bilateral ties maintained at various levels. The Turkish Foreign Minister conveyed the best wishes of President Recep Tayyip Erdogan and the people of the Republic of Turkey and congratulated Qureshi on his appointment as Foreign Minister of Pakistan.